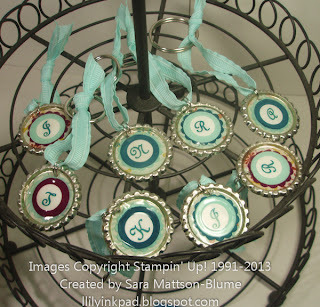 I love the bottle cap craze, so "had" to make some charms with them for bag tags. I printed 1/2" letters on my computer onto Whisper White, added some other layers and Voila! I also added a tea time charm to them when I added them to the bags. To make the bottle caps cuter, I flattened them by placing them in a normal sandwich on my Big Shot. I just turned the crank and Yee Haw, they looked cuter than before.